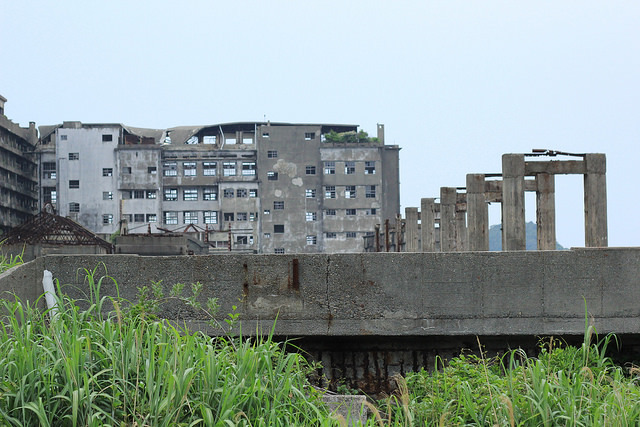 Have you heard of “Hashima” ? HHashima also called “Gunkanjima” means “Battleship Island” is a small island located about 15 kilometers away from the city of Nagasaki, in Kyushu area. The shape of the island from a certain view looks like a battleship. This island with full of ruins was abandoned in 1974 and has been forgotten. With the ruins, the island has the mysterious atmosphere and attracts people today. People lived there until 40 years ago. Some stuff is left behind, and time has stopped. This is a part of a house with old TVs left alone. The chalkboard tells us that is used to be a classroom. Probably back to the classroom. Students’ desks and chairs are just stacked; no one ever touches now. The island flourished during the industrialization of Japan which is around 1954 to 1961. The island was a coal-mine land, and 5,300 people lived at its peak, which means that population density was more than nine times larger than Tokyo at that time. People worked as coal miners and mostly brought the whole family to live in Hashima. However, due to the change of energy source from coal to oil, population and the output of coal both decreased gradually, led to close the mine in January 1974 and quickly became a desert island in April same year. At the time people were living, there were everything. 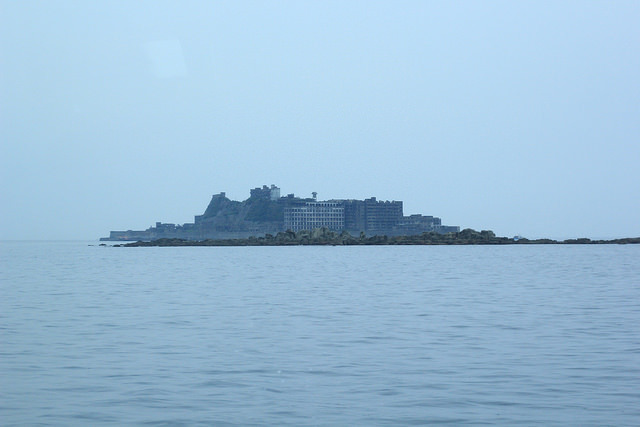 Hospital, school, movie theater, pachinko, night town….the island is small but had a complete function as a city. 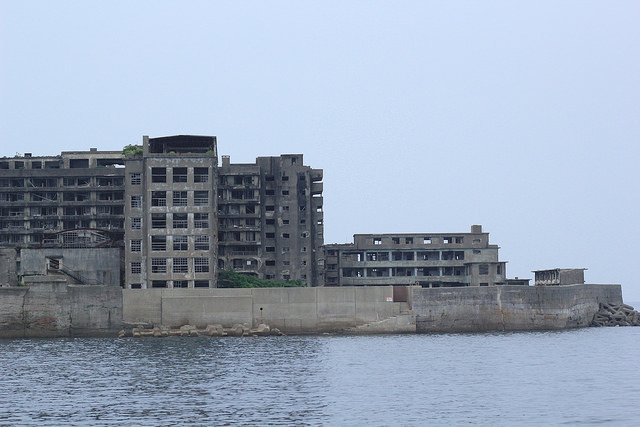 Now Hashima is registered as one of the World Heritage Sites because it is few sites that represent Japanese industrialization to people today. How to Go to Hashima? There is only one way to visit Hashima as a tourist. You have to go by the tour cruise. Today it is very strict, and no other way is allowed for visitors. Time duration and content of the tour is slightly different depending on which company you choose, but approximately 3-4hours long. Usually, there are two cruises each day, morning and afternoon. However, the tour does not assure you the landing, because it may be not possible due to the weather conditions. I participated in this tour in May 2015, so I will introduce how the tour is like. If you want to take pictures in direct light, board on the morning tour. In the afternoon the sun gets behind the building, but you can capture great photos. I would suggest to arrive early as possible and get in the line because the seat is not reserved. The ship of Gunkanjima Concierge Company has an upper floor which is open-air, and lower floor which is inside. Don’t worry if you can’t get the seat on the top floor! When the ship gets near Gunkanjima, staff suggests going to the upper floor to take pictures. Which side should you sit? I recommend the right side. On the way to Hashima, staff explains other famous spots as the ship passes, and there are more spots on the right side than the left side. After about an hour ride, you are going to capture the view of Hashima. The ship goes around the island so both sides of people can equally get to see the island. The guide explains major buildings as the ship goes around. The entrance is very small, so depending on the timing, you have to wait on the sea until the ship’s turn to land. When you land, all the guests move together. You will get to walk around only small part of the island. The guide will take you to 3 open spaces and explains about buildings and history of Hashima. You are free to take pictures as you walk along. 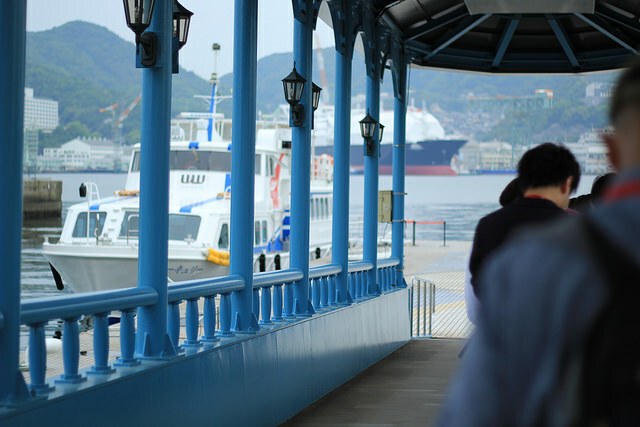 You will spend about 20-30minutes on the island, and get on the ship back to Nagasaki city. At the time I participated, there was a rock-paper-scissors tournament. There were 3 prizes relating to Hashima. Also, they played DVD about Hashima, so you will never get board during the journey. You can buy the ticket in advance from online. I strongly suggest doing this, because Hashima is getting more and more popular. Also, Hashima has very strict conditions for landing, if the wave is high, you are not able to land. If you strongly wish to land on Gunkanjima, you should plan to stay in Nagasaki at least two days to increase the chance. I hope your adventure be a good one.